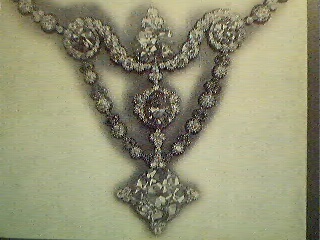 The Colonial Necklace featuring large yellow diamonds exhibited by Tiffany & Co. at the 1889 Exposition in Paris. The Louis XVI Revival design referred to the era of the American Revolution, just as the 1889 Paris Exposition celebrated the 100th anniversary of the French Revolution. 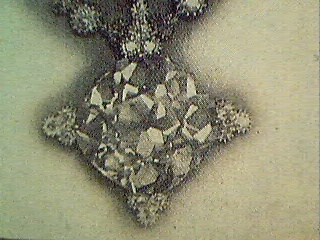 In the lower pendant was the Tiffany Yellow II Diamond (above photo), at the time the second largest diamond in the United States (after the Tiffany Yellow Diamond and the first large diamond to be cut in America. 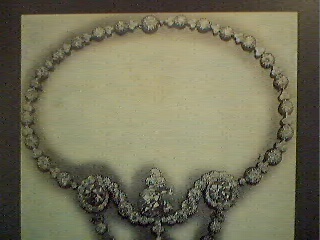 The lower and upper halves of the Colonial Necklace. It weighed 124.94 carats in the rough; Charles M. Field, foreman of the Henry D. Morse factory in Boston and inventor of the first modern diamond cutting machine, began cutting the stone on September 29th, 1883. Field finished the stone on January 11th, 1884. It was a European Cut weighing 77 carats. Sadly, its present whereabouts are unknown. 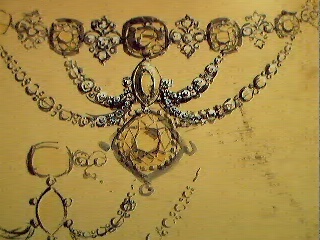 A preliminary drawing of the necklace from the Tiffany archives.